The present manual provides basic knowledge of the Oromo language, which – with about 30 million speakers in Ethiopia, Somalia and North Kenya – is along with Swahili and Hausa one of the most important African languages. 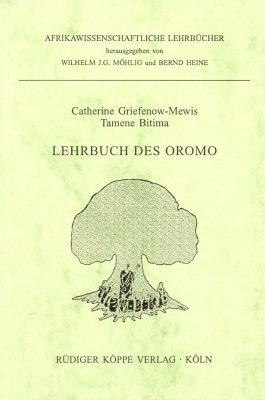 In connection with the Oromo exercise book this manual is suitable for language courses as well as for self-instruction. The manual consists of 20 lessons, each with a grammar and an exercise section. It is completed by Oromo texts from different sources, each of which comprises its own vocabulary section. Numerous grammatical tables, a glossary Oromo-German and German-Oromo, a grammatical index and a survey of verb paradigms facilitate learning and increase the practical value of the manual. Following the link at the bottom you will find the table of contents of the textbook. Insgesamt haben die Autoren eine sehr gute, klar und präzise verfaßte Einführung in diese nicht einfache Sprache verfaßt. Sowohl Studierende im Sprachkurs als auch Autodidakten dürften mit dem vorliegenden Buch ein wertvolles Hilfsmittel, auch zum anwendungsorientierten, über die Beschäftigung nur mit sprachlichen Strukturen hinausgehenden Lernen, vorfinden.